AN ILLUMINATION OF BLESSINGS is a unique visual interpretation of 36 universal blessings; an artistic legacy for generations to come. In recent years, I've learned that all of these skills and experiences have merged to inhabit the work I am meant to do. And that is why I went to Kickstarter with an unusual book project. The Kickstarter project was successfully funded and is now completed. 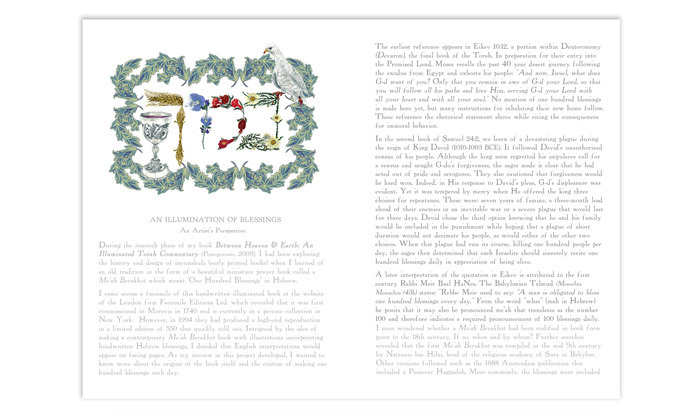 It is called 'An Illumination of Blessings' and promises to be unlike any book of blessings that you've ever seen. Since its publication, I've fielded many questions regarding the nature of my next project. Would I tackle The Book of Prophets, or do a Passover Haggadah? Perhaps, but not yet. 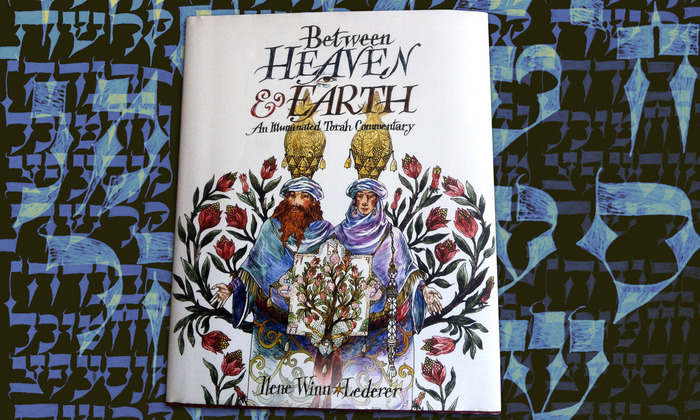 In the process of designing Between Heaven & Earth I've learned that while the Torah is the blueprint of creation, its collected stories of Biblical archetypes in the history of a nation are also a narrative to live by and a call for mindfulness in our relationship with the Source of all light and life. 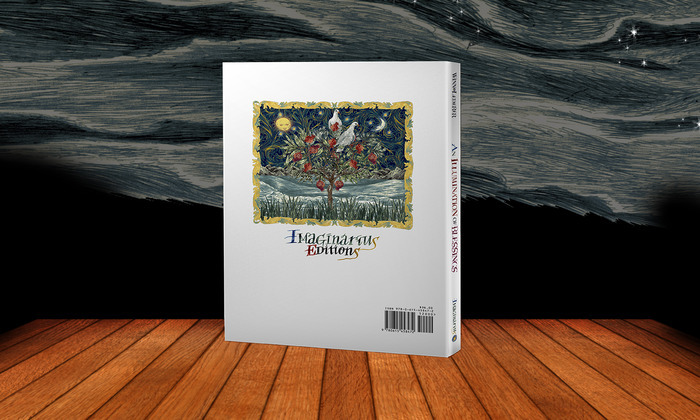 Because I've been very blessed by the warm reception that Between Heaven & Earth has generated, I decided that making an illuminated book of blessings would be my next creative priority. 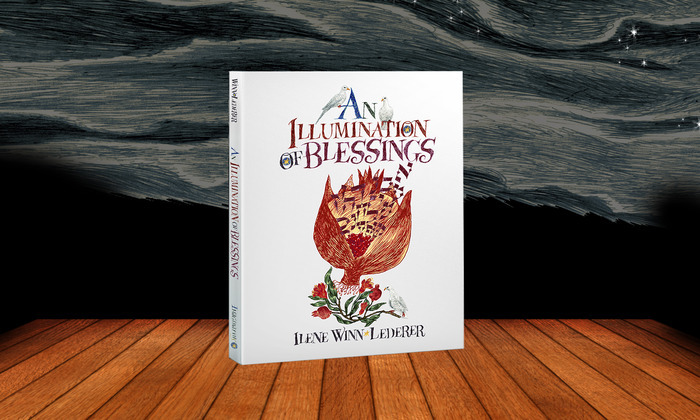 An Illumination of Blessings features my original illustrations and calligraphy in a unique interpretation of 36 blessings and one psalm that I've chosen from among the many that have been composed in the Jewish tradition over the centuries. Their purpose is to help us focus on our physical and spiritual well-being in the context of our relationship with the Source of all life. More specifically, they address the details of daily life, life-cycle events, the foods we eat and the natural phenomena of our world. In my book, the thirty-six blessings and one psalm will be arranged in six categories: Life, Sustenance, Journeys, Sight, Wisdom and Peace. Although the words of the blessings appear in Hebrew and in English, this book is not only for those who practice Judaism. Because these blessings are universal in nature, they speak to most aspects of daily life, inspiring ideas and actions meant to benefit us all. I've expressed this idea in my interpretation of Psalm 136, a poem praising the Source of all life and creation. There are some who maintain that a work of art needs no verbal explanation, but my experience has been otherwise. in light of the frequent questions I receive at my gallery/museum exhibits and from my published work, I have made it a practice to document my images both for myself and for my collectors. So, in addition to the blessings, there is a commentary presenting my thoughts on the evolution of each image. Please know that my words are there only to provide clues for you as an observer because I feel that a work is never really complete until you've contributed to its intent. 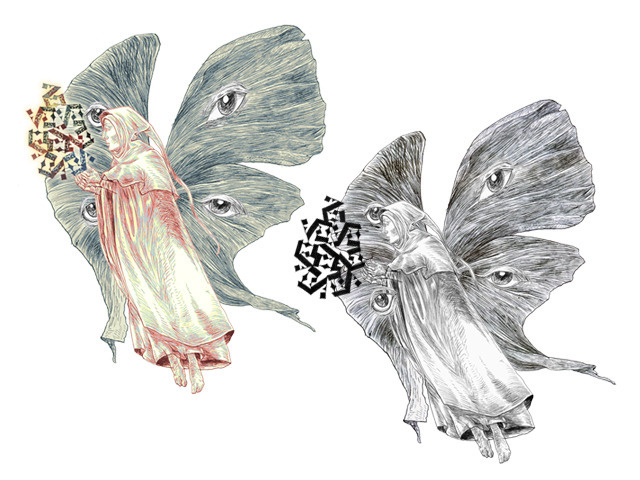 The illustrations for An Illumination Of Blessings are 'tradigital' which is a blend of traditional drawing with digital editing and color. 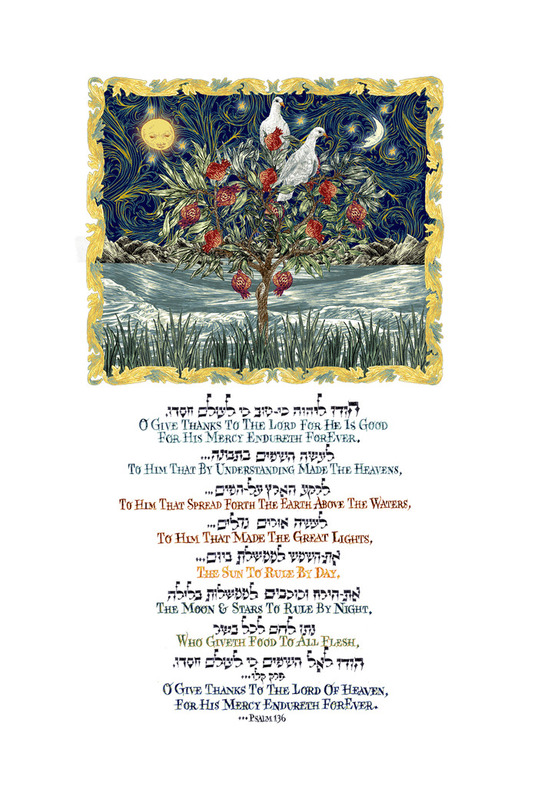 Each illustration will incorporate a Hebrew blessing with its English translation. These will be written with calligraphic alphabets that I designed especially for this book. The kickstarter project is over and the book is available for purchase. You can see comments about the book at my blog and at Facebook. I look forward to your questions and comments and to sharing An Illumination Of Blessings with you! The signed book can be ordered here via paypal for $36 dollars plus tax, shipping and handling. You can buy signed prints from the book at the magiceyegallery.com.